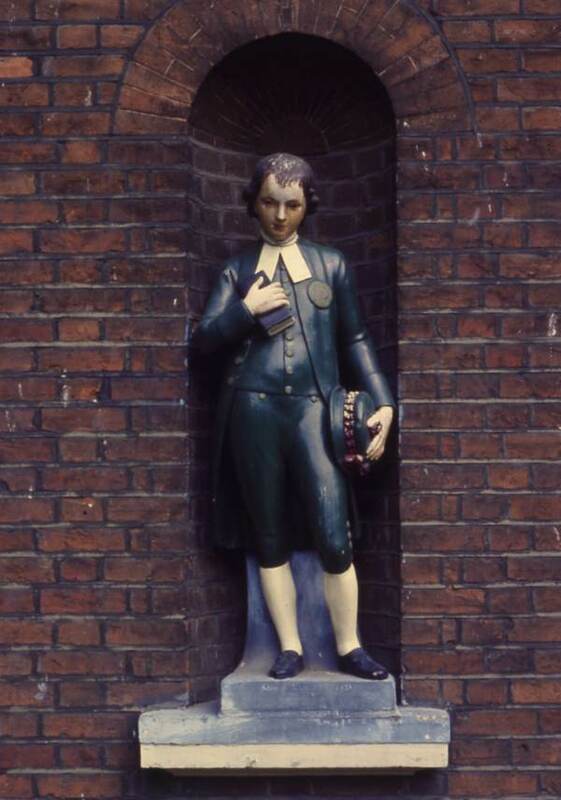 “It’s Coade stone – the woman died with the recipe, but now they’ve rediscovered it again,” added Reg helpfully and – sure enough – upon the base of the schoolboy are impressed the words “COADE LAMBETH 1821.” Born in Exeter in 1733, Eleanor Coade perfected the casting process and ran Coade’s Artificial Stone Manufactory from 1769 at a site on the South Bank, until she died in 1821 aged eighty-eight – which makes these figures among the last produced under her supervision. 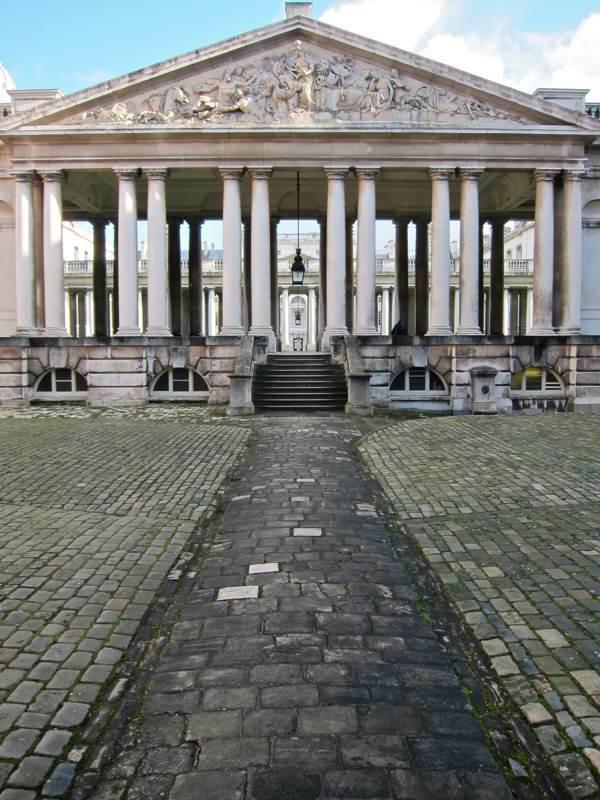 Mrs Coade was the first to exploit the manufacture of artificial stone successfully and her works may still be seen all over London, including the figures upon Twinings in the Strand, the lion upon Westminster Bridge and the Nelson pediment at the Old Royal Naval College in Greenwich. 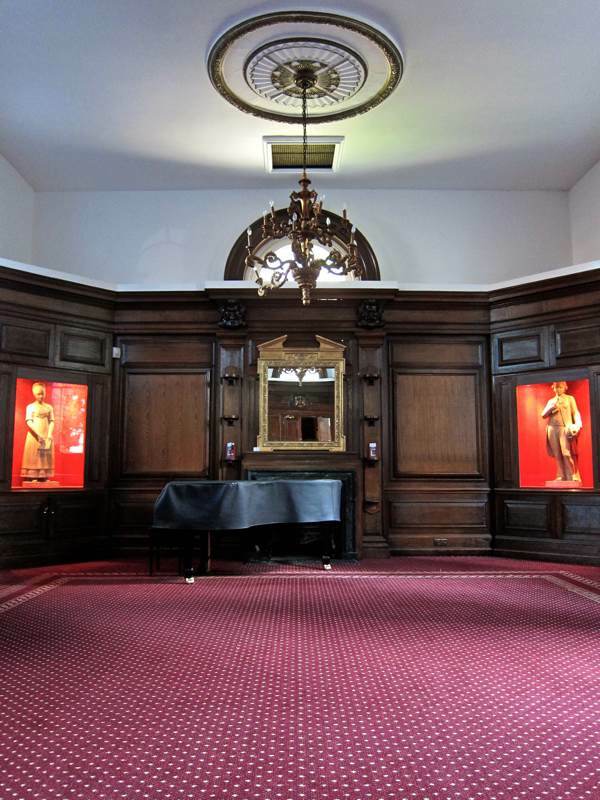 Reg took me inside to show me St Botolph’s Hall, lined two years ago with oak panelling of 1725 from a demolished stately home in Northamptonshire, where the two original statues peer out from behind glass seemingly bemused at the corporate City functions which commonly occupy their school room now. The Bishopsgate Ward School was begun in 1820 by Sir William Rawlins, a Furniture Maker who became Master of the Worshipful Company of Upholders and Sheriff of the City of London. In twenty years as Treasurer, he had lifted the institution up from poverty and it opened on 1st August 1821 with three hundred and forty pupils, of whom eighty needy boys and girls were provided with their uniforms. My favourite website, such a treat to read this over breakfast each morning. 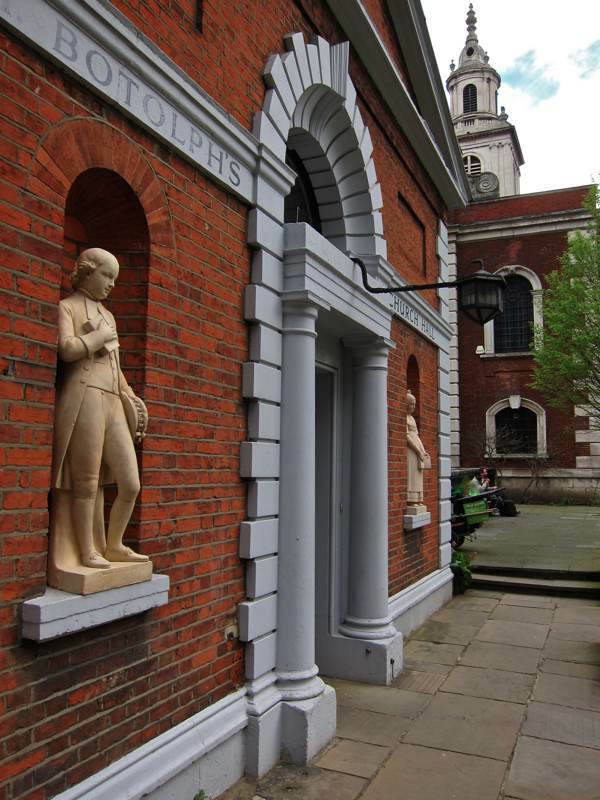 Strictly speaking the Bishopsgate Ward School was started in 1726 (some evidence for 1697 even), William Rawlins expanded it and built his building (thes tatues cost £15 each originally). The real hero of Bishopsgate schools was William ‘Hang Theology’ Roger, Rector here, who started so many schools in his time as a vicar it’s hard to keep count. We can thank him for Central Foundation and Alleyn’s Schools among others and he was the first person to turn his church graveyard into a public park, for City clerks to eat their sandwiches. Throw in innovative Sunday School outings for his poorer parishioners and he was quite the iconoclast. It’s all at the Bishopsgate Institute, like so much else. I kind of liked the painted figures…. How sad that the originals had to go indoors and the replicas outside. Whatever happened to good old respect “look but don’t touch?”. Does that apply to every statue and every quirky interest in London? I hope not! 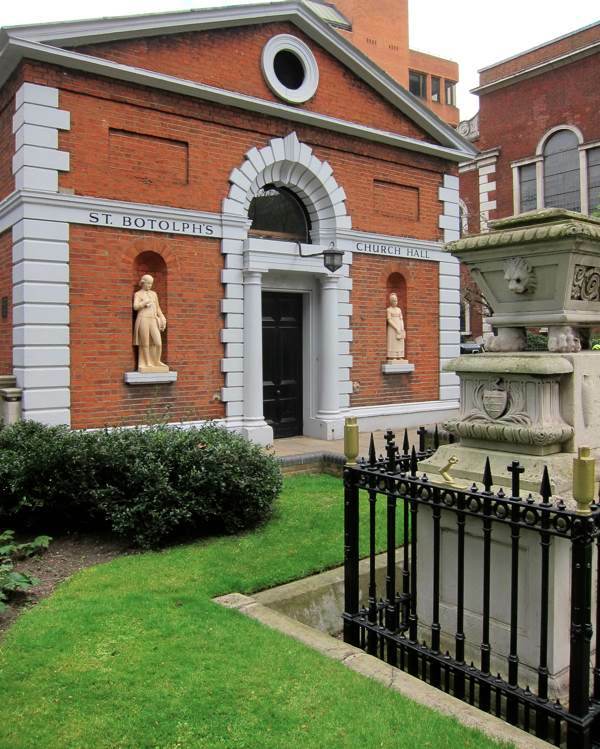 Central Foundation School whenit wsa in Spital Square. had replicas of these figures outside teh Head teachers Office. Theyn are now somehweree in the School in Bow Road and formwe pupils are always asking about them . I saw them for myslef about 2 years ago . Also saw these two replaicas last wekon a visit to the area ! Reg is a star! The Violet Needham Society meets there annually, and he always makes us so welcome. Wonderful story about children living in poverty and then got a sponsorship by the school in the past… — Also nice the commemoration with the statues! Fabulous blog today, we will all be at thechurch soon for a reunion service,this has whet my appetite nicely. Thank you Gentle Author. Good to see these back ! I was looking for them last year and wondered where they had gone. I liked the painted ones too. As an ex-pupil of CFGS , I remember having to draw the two figures and write an essay on the history of the school in the first year . This was compulsory for all pupils and I believe there was a prize for the best. Our sports houses were named Rawlins, Alleynn and Rogers . Very much looking forward to our reunion next month ! 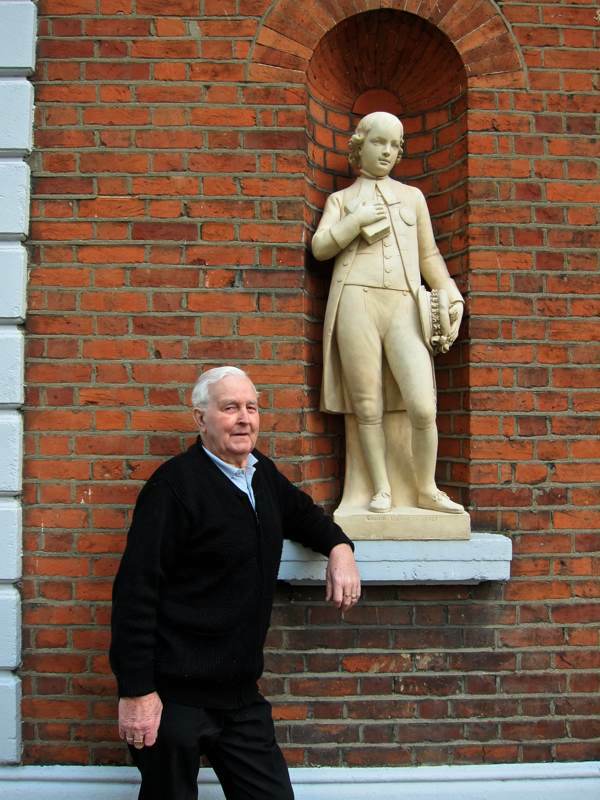 Lovely article – and what beautiful statues! Mrs. Coade was gifted. Can you give us more pictures of her sculptures and her history? It was very rare for a woman to be successful in business as a femme sole in the 18th and early 19th century. I enjoyed reading this so much – as always, gentle author, your articles make my day! A familiar sight for Central Foundation Girls. We had two replicas made from polished wood inside the entrance of our school. I was fascinated by them when I went for my first school interview. Our school in Spital Square was demolished but the wooden statues were moved, along with the school, to the new site in Bow. Thank you Gentle Author for this very interesting post. 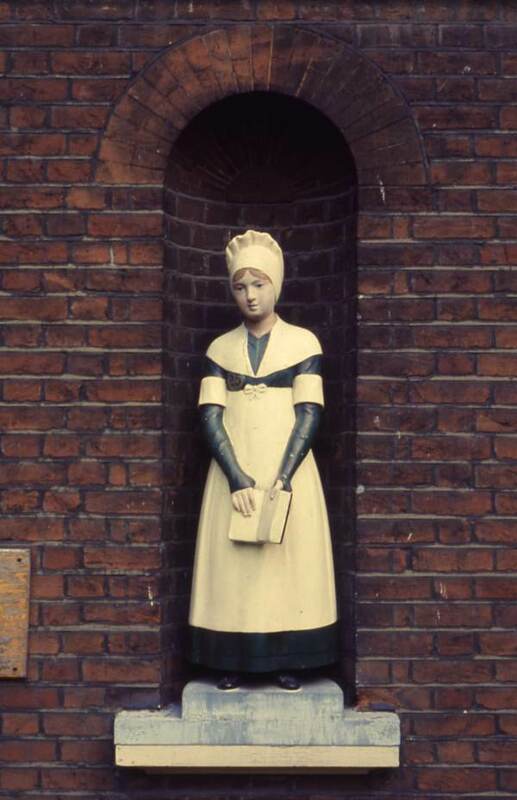 What a shame the figures were not repainted after the many layers of paint had been removed and the fine detailing revealed. Part of their history gone. Perhaps just the replicas could be painted? 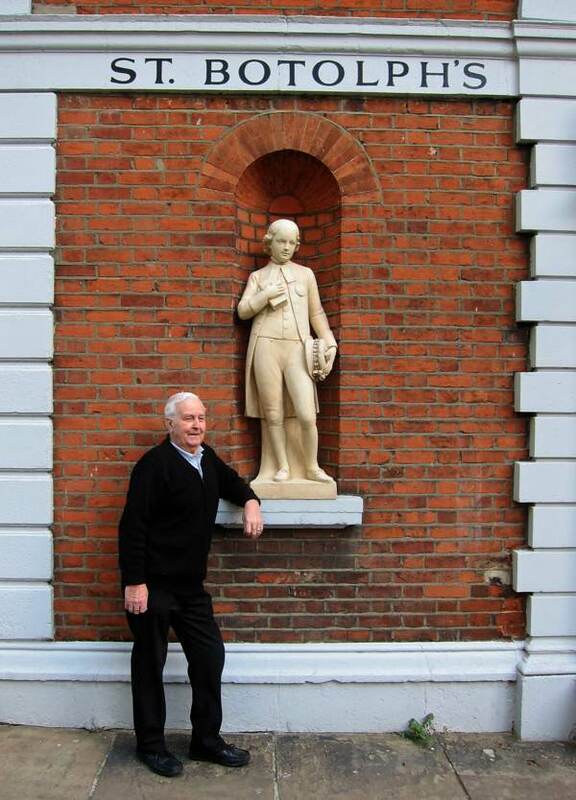 A very interesting story about the building and Coade stone. I agree about the paint. They look so formal and blank without it.